Kendriya Vidyalaya Sanghathan (KVS Recruitment), an Autonomous Organisation under Ministry of HRD has announced the recruitment for total 1017 vacancies of non-teaching posts of Administrative Officer, Lower Division Clerk (LDC), Upper Divison Clerk, Librarian, Finance Officer, Assistant Engineer, Stenographer, Hindi Translator, in Kendriya Vidyalaya Sanghathan (KVS). The online registration for KVS Recruitment 2018 will from 21.12.2017 and ends on 11.01.2018. The link to apply online for KVS recruitment 2018 (non-teaching posts) will activate on 21.12.2017. Kendriya Vidyalaya Sanghathan (KVS Recruitment), an Autonomous Organisation under Ministry of HRD has announced the recruitment for total 1017 vacancies of non-teaching posts of Administrative Officer, Lower Division Clerk (LDC), Upper Divison Clerk, Librarian, Finance Officer, Assistant Engineer, Stenographer, Hindi Translator, in Kendriya Vidyalaya Sanghathan (KVS). The link to apply online for KVS recruitment 2018 (non-teaching posts) will activate on 21.12.2017. 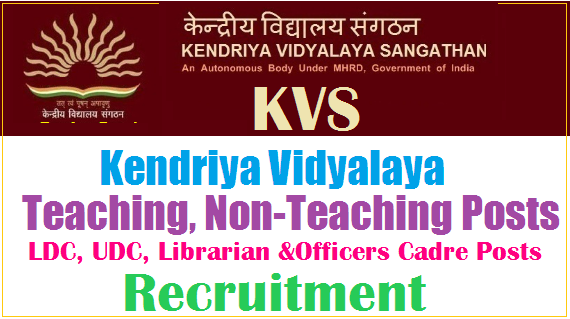 Kendriya Vidyalaya Sanghtan KVS Recruitment, an autonomous organisation under the Ministry of HRD has announced recruitment of 1017 Vacancies for various non-teaching posts. Some of the various posts in KVS include administrative officer, lower division clerk, upper division clerk, librarian, finance officer, assistant Engineer, Stenographer, Hindi Translator. KVS recruitment begins from 21st December 2017 and will go on till 11th January 2018. The total vacancies are 1017 for various posts under Kendriya Vidyalaya Sangathan Recruitment 2018 as reservation wise details. Age Limit: Candidates upper age should be 50 years for Post 1, 2, 45 years for Post 3, 35 years for Post 4, 5, 6, 28 years for Post 7, 30 years for Post 8, 27 years for Post 9, 10, 35 years for Post 11as on 31-01-2018. Age relaxation is applicable for SC/ ST/ OBC/ PH & Ex-Serviceman candidates as per Govt of India rules. Candidates should possess second class Masters Degree, B.Ed or equivalent Degree, 5 years regular service as Assistant Commissioner for Post 1, Masters Degree, B.Ed or equivalent Degree for Post 2, Graduation for Post 3, B.Com with 50% of marks in the aggregate and at least 4 years post qualification/ M.Com with 50% of marks/ CA (Inter)/ ICWA (Inter)/ MBA (Finance) or PGDM (Finance) with knowledge of computer applications for Post 4, Graduation/ Diploma in Electrical Engineering for Post 5, Graduation for Post 6 from a recognized institute with relevant experience. Class XII from a recognized board with a typing speed of 35 w.p.m in English or 30 w.p.m in Hindi on Computer. Bachelors degree in Library Science or graduate with a one-year diploma in library science from a recognized institution. Selection Process: Candidates will be selected based on Written Test, Computer Based Test/ Examination, Skill Test, Typing, Proficiency Test and or Interview. Application Fee: Candidates should pay Rs.1200/- for Group A, Rs. 750/- for Group B & C through online by using Debit Card/ Credit Card/ Net Banking (If Applicable). No fee for SC/ ST/PH & Ex-service men candidates. How to Apply: Eligible candidates may apply online through the website www.kvsangathan.nic.in from 21-12-2017 to 11-01-2018 at 11:59 PM. Start Date to Apply Online: 21-12-2017.